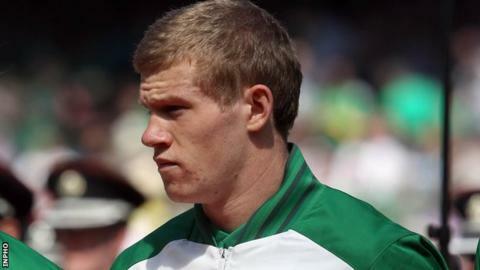 James McClean, Glenn Whelan and Sean St Ledger have all been ruled out of the Republic of Ireland's World Cup qualifier against Germany on Friday. Sunderland's McClean has a hip injury and may also miss next week's away qualifier against the Faroe Islands. Whelan and St Ledger have hamstring injuries and have also been ruled out of the game in the Faroe Islands. Richard Dunne and Kevin Doyle were already unavailable while Ciaran Clark is the latest squad call-up. Manchester United's Robbie Brady and Sunderland's David Meyler were called into the squad by Giovanni Trapattoni on Friday after Doyle's withdrawal. Aston Villa player Clark, who can play either at centre-back or in midfield, won his second cap against Wales in February last year but has been out of favour over the past 12 months. With Shay Given and Damien Duff having retired from international duty, Republic boss Trapattoni will be without six of the team that started in the concluding Euro 2012 game against Italy for Friday's clash against the Germans. Stoke midfielder Whelan came off with a hamstring injury in Sunday's goalless draw against Liverpool while St Ledger was forced to hobble off in Leicester's win over Bristol City. With St Ledger ruled out, it leaves the Republic with problems at centre-back with Dunne already ruled out of both qualifiers. Trapattoni may be forced to move regular right-back John O'Shea to central defence with Stephen Kelly in contention to be drafted into the back four. The return of Keith Andrews after suspension mean he is likely to replace Whelan although Trapattoni may be tempted to play five men in midfield. Stoke's Jon Walters started in attack in Kazakhstan alongside Robbie Keane but Shay Long will hope to get the nod to partner the Republic skipper on Friday. Doyle scored the late winner in last month's unconvincing 2-1 victory over Kazakhstan after coming on as a sub. McClean had to apologise to Trapattoni after posting a foul-mouthed tweet following his omission from the Republic's opening qualifier in Astana. Trapattoni's side take on Germany at the Aviva Stadium on Friday before facing the Faroe Islands away four days later. Brady scored on his debut in last month's 4-1 friendly win over Oman and also set up two goals but was only named on the standby list in the original squad for this month's qualifiers. Meyler also made his debut against Oman.